We REALLY should have learned by now not to complement the weather. No sooner had we sent our last missive off than we look behind us and ... Oh ... My ... Gosh! Where did THAT come from? 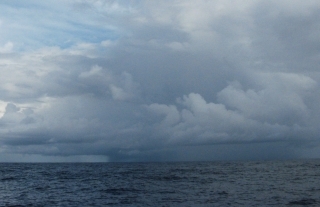 A huge black squall was right behind us. Since then we've had generally cloudy skies but no more rain, with winds of 12‑15 knots from almost directly behind us. We jogged a bit north of our track as our GRIBs said the skies would be clearer there but now we're back on track. Not much happening today. We defrosted and cleaned the fridge. Some cushions that got wet have been drying in the sun. The fishing lines have been out since first light but nobody's been interested. A freighter came within 1.5 miles of us this afternoon, on his way to Malaysia (but at 20 knots, he'll get there long before we do). At noon today we were at 2°13'N 82°25'E or 585 nautical miles from Gan with 799nm to go to our waypoint north of Sumatra. Early this morning, on Jon's 4‑8am watch, we crossed yet another invisible line -- the half-way point between Addu Atoll and our waypoint off the northern tip of Sumatra! The actual island off Sumatra that we turn around is called Weh, so this is a Half-Weh party! In celebration, Sue baked a loaf of whole wheat bread full of yummy sunflower, sesame and pumpkin seeds for lunch. The high overcast has kept the day cooler, so the oven heat wasn't really noticed. The sails are still set one to each side, or "wing and wing" as we call it, and the following breeze of about 12 knots keeps us moving at 6 knots (about 7 mph or 11 kph) - sort of a comfortable jog. At that speed, these oceans are BIG! This will probably be our 2nd longest passage ever in Ocelot. Not much going on out here. Sue is in book #4 of this passage. Jon continues to work his brain with challenging Sudoku puzzles, and we're both keeping up with our (much needed) sleep. At 4pm we crossed one of the few labeled lat/lon street corners of the ocean: exactly 3°N 85°E. That doesn't happen so often! 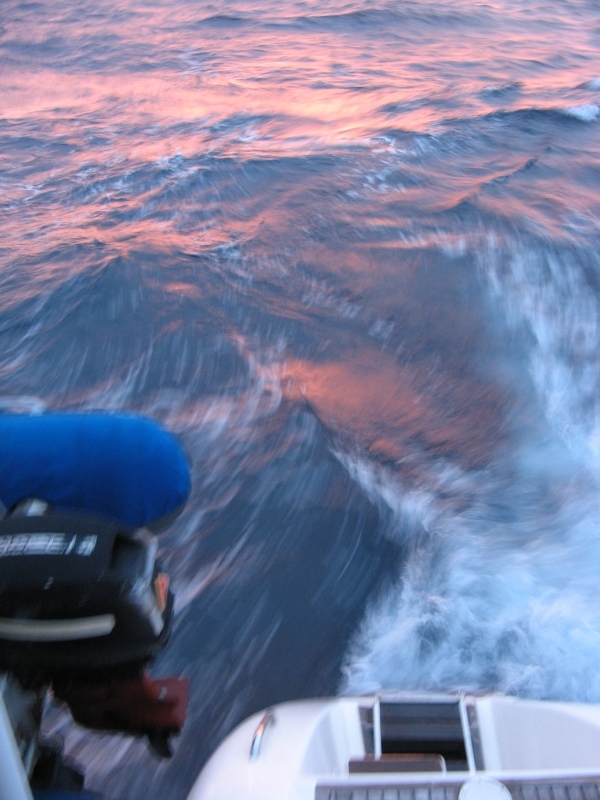 We now have 640 nautical miles to go to our Weh‑point off Sumatra. A lone Wilson's Storm-Petrel, a small all-grey sea bird with a white rump, flitted around Ocelot for a few minutes checking us out. We hoped it wasn't going for the lures we trail behind us. But no, just a few close sweeps past the cockpit to say Hello, then off, feet trailing daintily, to glide and flap over the waves in search of some small morsel from the sea.